While the chances of a white Christmas in the desert may be slim-to-none, a lot of states can't hold a candle to Nevada when it comes to sparkling brightly during the holiday season. • Want to see acres of Nevada cacti lit up like a Christmas tree? 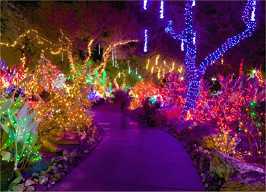 Check out Ethel M Chocolates Holiday Cactus Garden just outside Las Vegas in Henderson NV where 600,000 lights illuminate the Botanical Cactus Garden every year for the holidays. And, if you get weak in the knees from all the dazzle there's always chocolate. • Boulder City couple Dale Ryan and Dyanah Musgrave were the big winners on ABC's national competition holiday special in 2016, "The Great Christmas Light Fight". The Nevada couple snagged the trophy, and $50,000 in prize money for their display which included a working ferris wheel, a ski lift, a train, and a carousel. • Don your Santa outfit, reindeer or elf costume and head to the annual Reno Santa Pub Crawl with dozens of participating taverns joining in the fun to serve up holiday libations. Along with the seasonal hoopla, the annual Reno event also serves as a fundraiser for local neighborhood charities. A Gift of Lights - Check out a major Las Vegas tradition with millions of lights aglow just for the holidays. Magical Forest - Get your elf on at Opportunity Village in Las Vegas offering a spectacular array of holiday lights, Forest Express passenger trains, antique carousel, Alpine slide, and a visit to Santa - for kids of all ages. Sparks Hometowne Christmas - A colorful holiday parade, entertainment, photos with Santa, arts & crafts vendors and a spectacular tree lighting ceremony are included in early December. Virginia City Christmas - Check the event calendar for this year's Christmas Parade of Lights and the Christmas on the Comstock celebration. Nevada Christmas - Join the Kremer Family for the annual holiday house display in Minden, incuding videos, photos, FAQ.